It is no secret that Marica and I are total VISI fans. 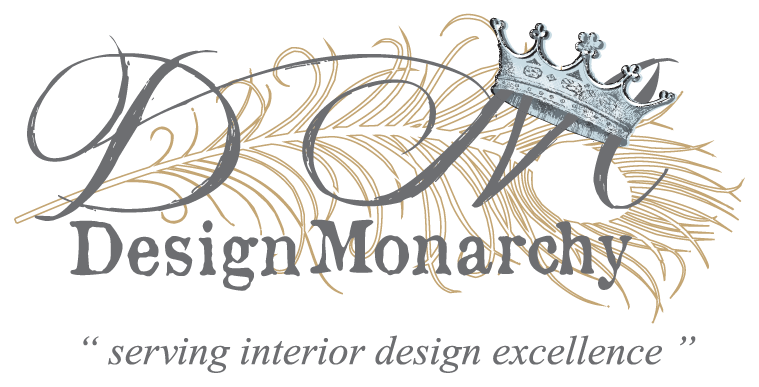 Naturally, when they approached The Design Tabloid to get the Décor Diva‘s view on blogs, social media and it’s effect on design, for the February 2013 Issue – we were over the moon. However, the best was yet to come. We found that we had managed to sneak into one of the best issues I have read to date. Brilliant page turner for design lovers such as we are. 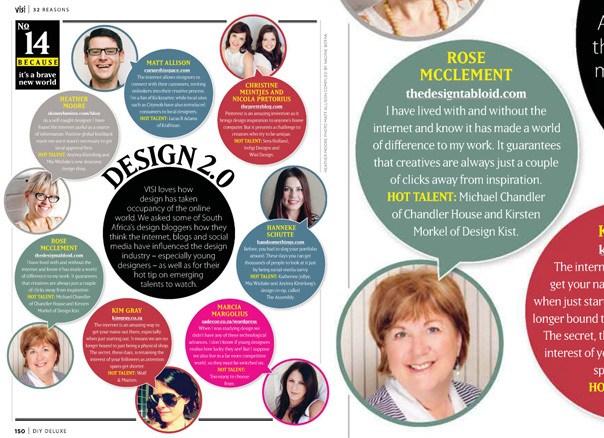 Seriously – by the time I had turned the last page, I still wanted more – more of those divine VISI-styled images, more news, views, and interviews about the clever local creatives and their products. This DIY issue even had the unmotivated DIY-er in me going, wanting to get to my trash and make something to boast about with it. 1} Okay as expected – I am going to point you directly to the page that has given The Design Tabloid national print media coverage – Page 14 of the awesome section “32 Reasons to always love smart ideas”. Altogether now – Whoop, Whoop!! 2} Dustbin Décor – working with plastic bottles to make a bird-feeder (hubby favourite) and what looks like something so do-able – the Liquid Chandelier. It just blows my mind that we can create such easy peasy good-looking items from what has always been termed “rubbish”. You do however need someone with some electrical understanding to stand by you. 5} Page 84 had a full page image of row upon row of toasters, stretching from what I can only imagine to be the 50s to present time. That was sobering for me. Why? Because I have experienced many of those toasters at one time or another in my lifetime. 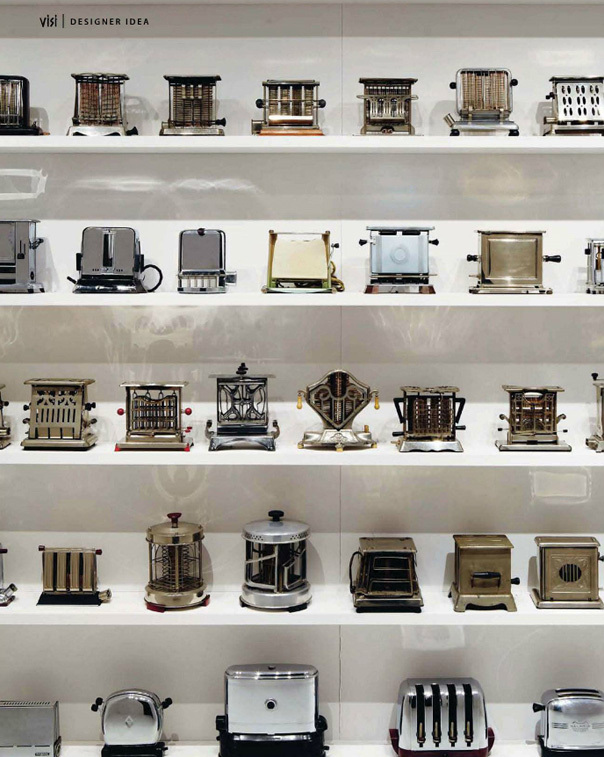 NO – who wants to be reminded how many toaster designs you have lived through! Dah. Just as a postscript here – when Marica and I spoke about this toaster business, she went on to tell me about an awesome lighting project she did while studying design. It involved one of them toasters. It sounds totally ingenious, just as she is. I am trying to get her to write a post on that toaster. Maybe you can join me in nudging her. 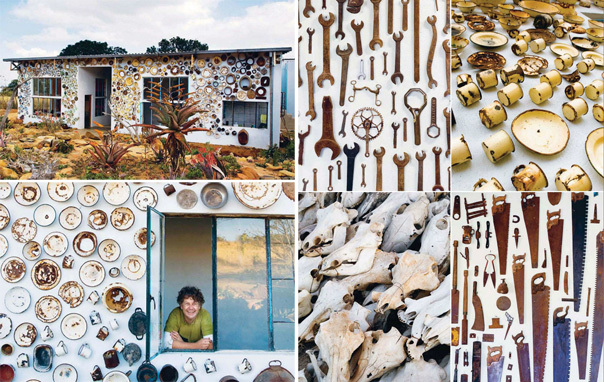 6} While in the Obsess & Collect section, another truly creative and authentic SA collection by Ekim Falconer of Bone Idol (cool name) was a display of rusted implements, crockery and skulls. Mostly stuck onto the front of his house! It blends beautifully into the natural surroundings. Which is what makes it so clever? Man oh Man – some people might think that they are “bone idol” but ingenious they are! 7} I am not too sure whether it was 2010 or 2011 that I first encountered the “Yarn Bomber” – Cape Town’s own Isabeau Joubert. She had a field time bombing various iconic statues or public arenas with huge knitted coverings. There was a time when I knitted some and that is why I was intrigued by this yarn bombing sub-culture. Read about her on Page 180. This issue of VISI has once again brought home to me what a plethora of creative talent is to be found in South Africa. Creatives that take our natural and cultural aspects to broadcast our unique South Africa brand. 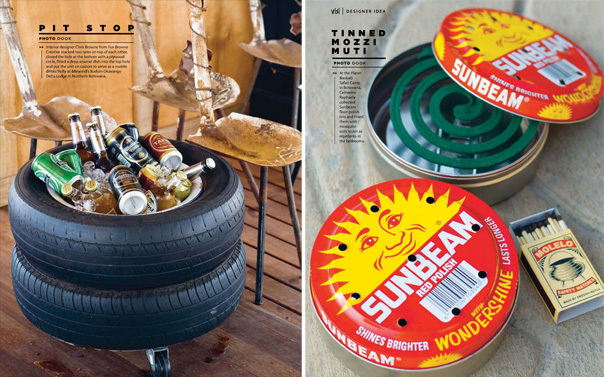 I am reminded that The Design Tabloid came about for this very reason – to showcase SA talent. 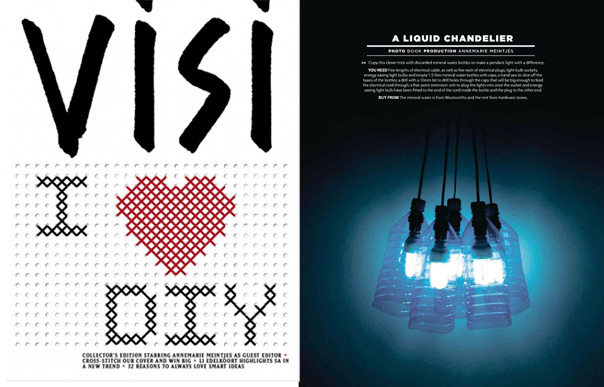 My question to you in closing is this: “Have you read the I Love DIY issue of VISI?” If not, why not? JUST DO IT!